Keeping it fresh in some winter whites and neutrals. It started to warm up a bit last week, letting me leave the apartment without a coat for once in a long while. It was 45 degrees and I took full advantage. I had forgotten what the sun felt like! You can tell my skin is basically just another winter white in itself. I love winter white! The way you have styled this outfit is total perfection. The addition of the sequin body suit adds a glam touch. 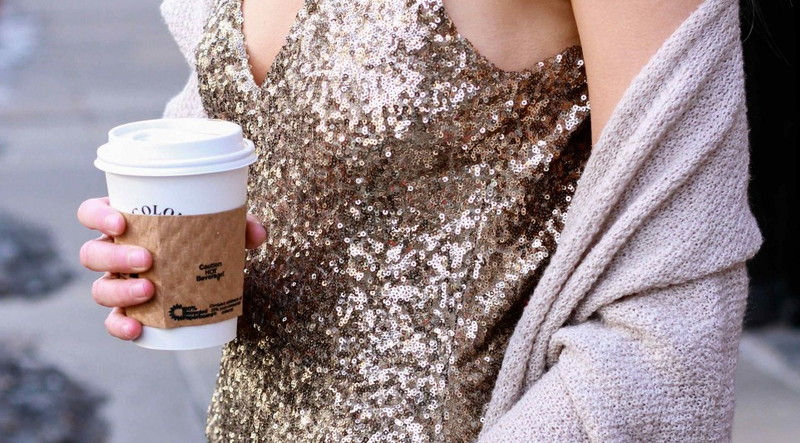 I love wearing sequins during the day! Obsessed with this look, Casey! Love the gold sequins with the whites. Also, where is that necklace from, I love it! The necklace is from a little boutique called Standard in Kansas City. Nice to see you are back from your adventures!! In love with the white and gold color combination! So amazing! I just find it impossible not to comment on this look. Complete simplicity and the daring twist of the sequined top, adds a touch of glam, boldness and harmony. Also the cardigan looks really comfortable and absolutely stylish with the rest of the look. I recently published a post also enhancing the winter whites trend. Check it out and tell me what you think.